Today I am sharing our Brilliant Activities for Birth Educators idea for June! "Should I Stay or Should I Go Now? "- submitted by Lamaze Certified Childbirth Educator Mindy Cockeram. The Brilliant Activities for Birth Educators series contain fun and interesting ideas that childbirth educators can use in their Lamaze classes to make them engaging and memorable for the families in attendance. Today's idea covers when families in labor should move to the birth location. Do you have a fun teaching idea that you would like to share in a future Brilliant Activities for Birth Educators article. Please pop me an email and we can connect. - Sharon Muza, Community Manager, Science & Sensibility. The topic of 'when to go' to the hospital or birth location, when a woman is in labor is one subject I'm sure most childbirth educators discuss early on in the childbirth class series, - possibly even on the first night - because it is one of the most perplexing and often worrying topics on which families want clarification. I find that most people have received many different pieces of advice about 'when to go' from a whole host of friends, family and care providers. When we start discussing contraction timing, I suggest families use the '3 in 10' guideline (3 contractions in ten minutes OR five minutes apart for a whole hour). 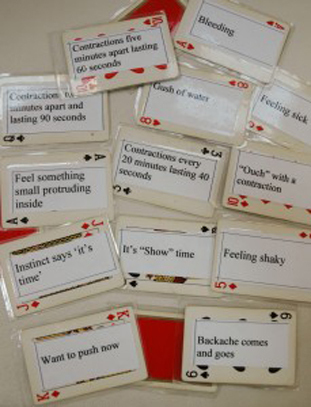 But of course active, well-established contractions are not the only reason to turn up at Labor & Delivery and so we use this deck of cards to introduce different situations and their possible ramifications. If I stay there will be trouble. If I go there will be double? I shuffle the "Clash Deck" and then hand the deck to a partner. The partner then takes the top card off the deck and reads it out. I shout out to the class 'Stay or Go?' and they decide and answer back. Often the reactions are mixed, so I usually facilitate a discussion if necessary and introduce the evidence based arguments. If the situation on the card would send the pregnant person to the hospital, the deck is handed over to the next family. If the situation on the card is not a reason to go, the same family draws the next card. Often a family will draw a card signaling early labor, then draw the loss of the mucus plug ('showtime'), then 'feel shaky' before finally drawing 'want to push now'. It's fun watching the pregnant person's face and the partner's reaction as they read the next card if they are 'still at home'. Depending on the number of cards in your deck, the activity normally takes about 20-30 minutes to do well. It is interesting to see how often the partners disagree with the pregnant people about whether to stay or go. The statements that usually create the most conversation are 'Gush of water' (termPROM), 'Feel something small protruding inside' (rare cord prolapse), 'Instinct says it's time' and 'Backache comes and goes' (possible posterior labor). I always present the evidence for staying at home with term PROM vs going in and the difference between guidelines for PROM in the USA (baby out within 24 hrs from PROM) vs the UK (if PROM within 24, baby out within 48) where I trained. PROM usually also leads into a light discussion on warding off Group B Strep and other bacteria by evening out the 'bad' bacteria with the 'good' bacteria (lactobacillus). In the first class I also show a hypnobirth video clip and the pregnant person is totally silent. When a family reads out 'ouch with a contraction' and all yell 'stay', I remind them that the hypnobirthing person we watched never once murmured 'ouch' and a baby popped out. Then we discuss how people will have different 'ouch tolerances' based on their length of labor and the position in which the baby is in. So eventually they realize they should time the 'ouch' instead of trying to guess dilation based on the sounds that are being made. 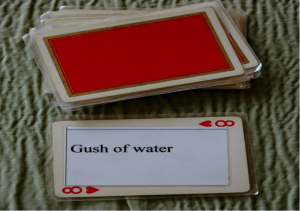 You can add any situation or symptom to a card that you like. I'm in California and am thinking of adding 'Feel an earthquake' to my "Clash Deck" to see what they think. I also want to add some pre-eclampsia symptoms like 'have a persistent headache with flashing aura' while Pre-Eclampsia Month is still fresh in my mind. It is really simple to make the card deck. Just type or write out situations or symptoms like I have and attach each one to each card from an old deck. Then laminate the cards between two sheets of plastic laminate, cool and trim with scissors. Leave a bit of a plastic edge when you trim them otherwise they might peel if cut too close to the card. I've been using the same deck for almost ten years and they've held up very well. The class seems to love this activity and I hope you do to. Let me know if you have any questions or feedback on its use in your classes. Mindy Cockeram is a recently recertified Lamaze Educator working with a large hospital chain in Southern California where she's been teaching for four years. She trained initially through the UK's National Childbirth Trust in Wimbledon, England in 2006 after a career in the financial markets industry in London. She graduated from Villanova University in 1986 with a bachelor's degree in Communications and a minor in Business Studies. 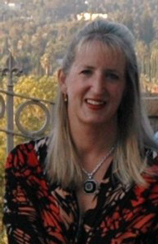 Currently working on a book, she resides in Redlands, California with her British husband and two children.